Problems affecting the two peroneal tendons that lie behind the outer ankle bone (the lateral malleolus) are common in athletes. These problems mainly occur in the area where the two tendons glide within a fibrous tunnel behind the lateral malleolus. What part of the ankle is involved? The peroneals are two muscles and their tendons that lie along the outside of the lower leg bone (the fibula) and cross behind the lateral malleolus (the outer ankle bone). The term medial refers to a point closer to the center of the body. So the ankle bump on the inside edge of the ankle (closest to your other ankle) is the medial malleolus. The term lateral refers to structures furthest from the center. 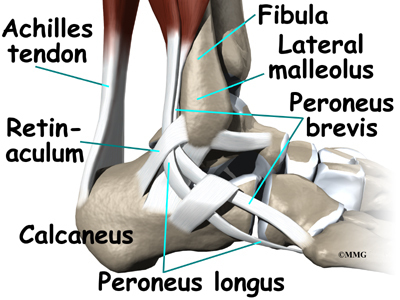 Major muscles that support the lateral part of the ankle are the peroneus longus and the peroneus brevis. The tendons of these two muscles pass together in a groove behind the lateral malleolus. (Tendons attach muscles to bones.) 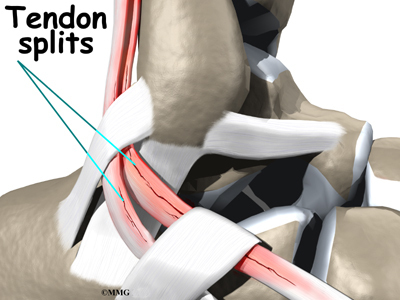 The tendons are kept within the groove by a sheath that forms a tunnel around the tendons. The surface of the tunnel is reinforced by a band of tissue called a retinaculum. 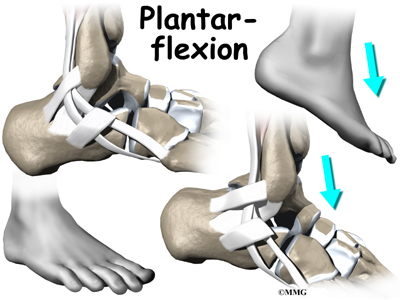 Contracting the peroneal muscles makes the tendons glide in the groove like a pulley. 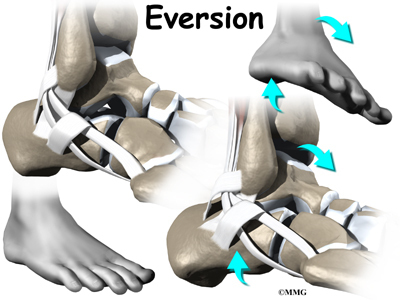 The pulley action causes the foot to point downward (plantarflexion) and outward (eversion). 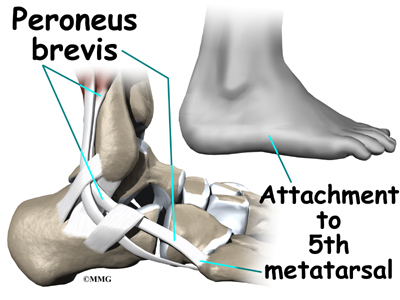 The peroneus brevis tendon connects to a bump on the base of the fifth metatarsal. This spot can be felt midway down the outer edge of the foot. 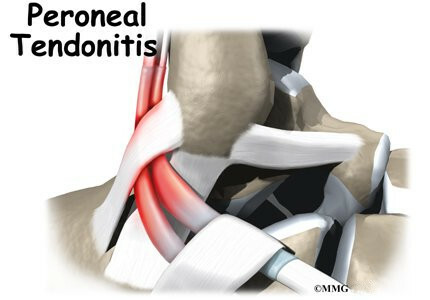 The peroneus longus tendon lies behind and below the peroneus brevis tendon. It wraps down and under the foot by way of the cuboid bone, the outer tarsal bone just in front of the heelbone (the calcaneus). 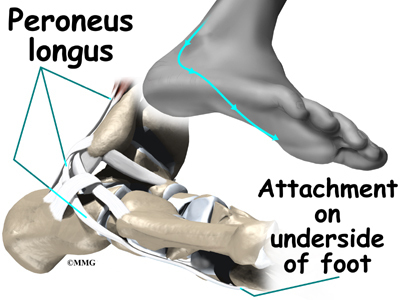 The peroneus longus tendon angles forward under the sole of the foot and connects to the bottom of the main bone of the big toe. This tendon stabilizes the arch of the foot when walking. Peroneal tendon problems mostly occur where the tendons glide within the pulley behind the lateral malleolus. Their movement can cause irritation of the lining of the tendons. This condition is called tenosynovitis. The irritation can also occur after an ankle injury, such as a blow to the outside of the ankle or an ankle sprain. Repetitive ankle motions in sports, such as running and jumping, can lead to wear and tear on the tendons inside the groove. A high arch puts extra tension on the peroneal tendons within the groove and has also been found to cause peroneal tendon problems. 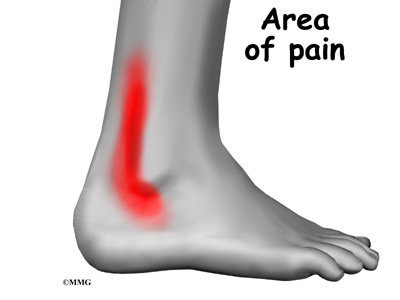 Peroneal tendon problems commonly occur from an ankle sprain. During the typical inversion ankle sprain, the foot rolls in. This type of injury sprains or tears the ligaments that support the lateral part of the ankle. The forceful stretch on the peroneals when the foot rolls in can also cause a lengthwise tear in the peroneal tendons. An inversion ankle sprain can also cause the peroneal tendons to momentarily slip out of the groove. This is called subluxation. Peroneal tendonitis often occurs during the recovery period after an ankle sprain. Because the ankle is unstable, the peroneals may need to work harder to give needed support to the damaged lateral ankle ligaments. The overwork sets them up for subluxation. In some patients, a peroneal tendon problem is caused by degenerative changes in the tendons themselves rather than by inflammation around the tendons. The tendon itself becomes abnormal. Doctors call this condition tendonosis. In tendonosis, the tendon becomes weakened. Tendons are made up of strands of a material called collagen. 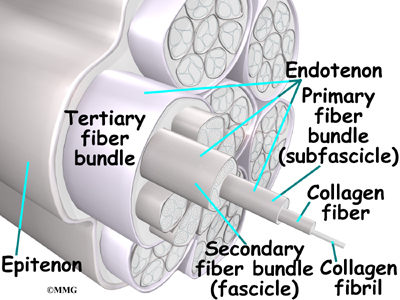 (If you think of a tendon as a nylon rope, the collagen is the nylon strands.) 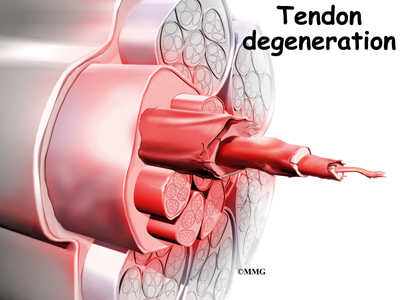 Degeneration in a tendon causes a loss of the normal arrangement of the collagen fibers that join together to form the tendon. Some of the individual strands of the tendon become jumbled due to the degeneration, some fibers break, and the tendon loses strength. 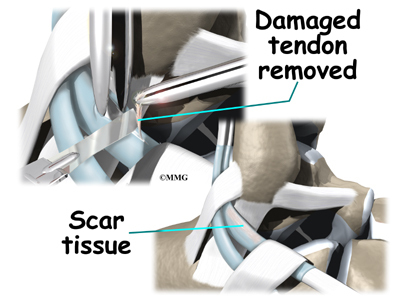 Over time, the tendon thickens as scar tissue tries to repair the damaged tendon. The area of tendonosis in the tendon is weaker than normal tendon. The weakened, degenerative tendon may tear. This usually causes a lengthwise split in the peroneal tendons rather than a rupture. 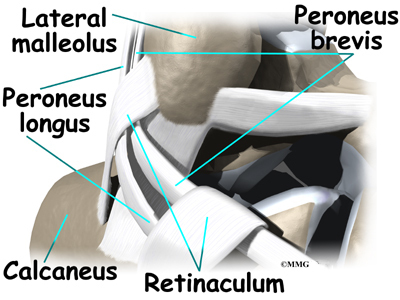 These splits or tears are most common in the peroneus brevis tendon, probably because it lies in front of the peroneus longus. It is more vulnerable to friction because it rubs against the groove in the fibula bone. What do peroneal tendon problems feel like? Patients with peroneal tendon problems usually describe pain in the outer part of the ankle or just behind the lateral malleolus. This pain commonly worsens with activity and eases with rest. Patients may have swelling behind or under the lateral malleolus. They may notice more pain when pressure is applied along the tendons. The diagnosis of peroneal tendonitis is usually made by examination of the ankle. X-rays may be ordered to make sure there is no fracture or other problem. The physical examination helps determine where the tendons are inflamed, ruptured, or degenerated. The doctor will move your ankle into different positions. The peroneal tendons are checked by holding your foot up and out against the doctor's downward pressure. Stretching the foot up and in can also be used test whether the tendons hurt. Your doctor may order a magnetic resonance imaging (MRI) scan of your ankle. These images can show if there is abnormal swelling or scar tissue in the tendons. MRI scans can also show lengthwise tears in the tendons. Nonsurgical treatment for peroneal tendon problems helps control symptoms. Surgery is usually not considered until it has become impossible to control the symptoms without it. Initial treatments may involve resting and protecting the sore tendons. You may need to immobilize your foot and lower leg in a a short-leg walking boot for two to four weeks. In less severe cases, you may use a stirrup ankle brace, arch support, or lateral heel wedge to take tension off the sore tendons. You will probably work with a physical therapist. The therapist may use heat, ice, and ultrasound treatments to reduce pain and swelling. Stretching, strengthening, and ankle coordination exercises are added as symptoms ease. Your doctor may also prescribe medications. Anti-inflammatory medications can help ease pain and swelling and get you back to activity sooner. These medications include common over-the-counter drugs such as ibuprofen. In rare cases, cortisone can be injected into the sore tendons to relieve symptoms that won't go away. Cortisone is a powerful anti-inflammatory medication. Because there is a risk that cortisone will cause a tendon to rupture, doctors are very cautious about injecting cortisone into the peroneal tendons. 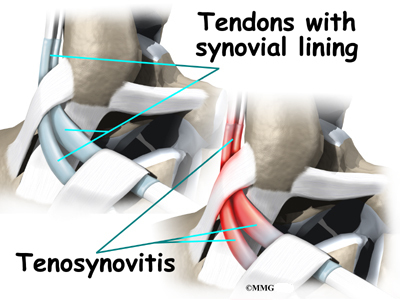 When the lining of the tendon is painful and inflamed (as in tenosynovitis), the goal of surgery is to remove the irritated tissue from around the tendon. This operation is called tendon release. 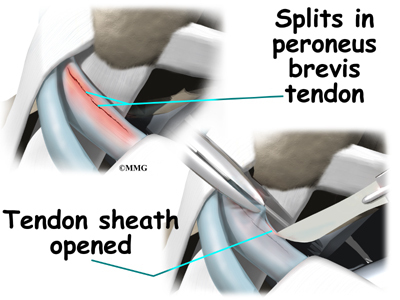 This procedure is done by carefully dividing the tendon sheath that encloses the tendon. 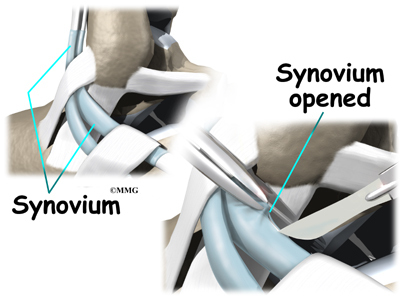 Once the sheath is opened, the surgeon clears away the irritated tissues around the tendon. The sheath is not stitched back together. The gap in the sheath will eventually fill in with scar tissue. The skin is closed with sutures. The procedure for surgically treating tendonosis is similar to the method used for tenosynovitis. However, extra measures are taken to thoroughly remove (debride) the degenerated tissue around and within the involved tendon. Tendonosis may require repair if a preoneal tendon is split down its length. This type of tear mainly affects the peroneus brevis. 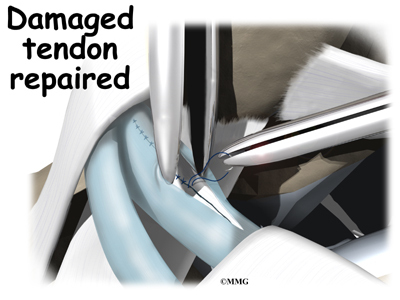 The surgeon fixes this problem by first dividing the sheath around the tendons. If the split is smaller than one-third the width of the tendon, the torn portion may simply be removed. Larger splits are sutured along the length of the tendon. The tendon sheath is repaired, and the skin is closed with sutures. Even if you don't need surgery, you may need to follow a program of rehabilitation exercises. Your doctor may recommend that you work with a physical therapist. Your therapist can create a program to help you regain normal ankle function. It is very important to improve strength and coordination in the ankle. Patients are usually placed in a short-leg cast for four to six weeks after surgery. A special walking boot is worn for another four weeks. Patients usually take part in formal physical therapy once the cast is removed. Rehabilitation after surgery can be a slow process. You will probably need to attend therapy sessions for one to two months, and you should expect full recovery to take up to four months. The first few physical therapy treatments are designed to help control pain and swelling from the surgery. Ice and electrical stimulation treatments may be used during your first few therapy sessions. Your therapist may also use massage and other hands-on treatments to ease muscle spasm and pain. Treatments are also used to help improve ankle range of motion without putting too much strain on the healing tendons. After about four weeks you may start doing more active exercise. Exercises are added slowly to improve the strength in the peroneal muscles. Your therapist will also help you regain position sense in the ankle joint to improve its overall stability. The physical therapist's goal is to help you keep your pain under control, improve your range of motion, and maximize strength and control in your ankle. When you are well under way, regular visits to the therapist's office will end. Your therapist will continue to be a resource, but you will be in charge of doing your exercises as part of an ongoing home program. All content provided by eORTHOPOD® is a registered trademark of Medical Multimedia Group, L.L.C.. Content is the sole property of Medical Multimedia Group, LLC and used herein by permission.